I don't really know what to say about this book. I heard so much hype, so many recommendations and I got really excited to read it. But I did not like it all that much. It actually caused me to not want to read for a long period of time (look at how long it took to complete it). Granted there were elements of this story I enjoyed. I adored the characters, and I truly thought the character development was well done, but the book as a whole? Not for me. I found it was 500 pages of semi-interesting plot development, adequate character development but it really dragged on. Then you get hit with 200 pages where it seemed like everything was being jammed in, in order to complete the plot. The last 200 pages were significantly better then the previous 500 but it wasn't enough for me, I didn't feel immersed in the story, and I think that comes down to a fundamental lack of a world build. It seemed as though things were being thrown into the plot without much explanation. 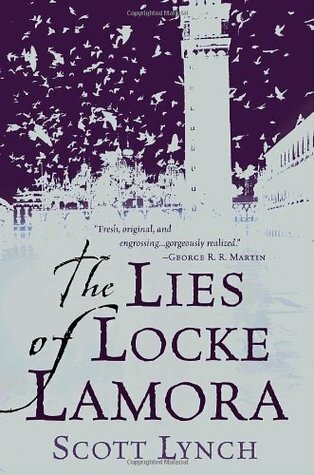 The interludes were used to develop locke's story, but I didn't feel as though much time was given to other major themes/ characters and certainly not enough to the world build. The ending was action packed but it was too compact. Everything seemed to happen in the last 100 pages, and in a book of over 600 pages it really made the first 75 percent of the book a grind. Maybe it wasn't for me, as a lot of people seem to love this book. Like the characters, didn't love the story. Definitely worth a read though!